The following article is probably the most crucial and important document that most of you will ever read in this lifetime! It is essential, whatever your beliefs and followings, that, if nothing else, you at least read the following information, it may have a profound effect on all our lives on this planet and prepare the way for humanity. Is there a war going on in the outer reaches of our Solar system? Can we protect planet earth, which is about to enter the next ascension? And can we avoid being drawn into it-we may, if we can acquire the attention of certain agencies as to the correct method of protection as laid down under this planet aeons ago. What are those enormous anomalous objects observed orbiting our sun, and what is their intention? Many of you may have read the GENESIS CONNECTION dealing with our true origins on this planet, and much was further clarified in our second article CRYSTAL CLEAR concerning the crystal deep below the Giza plateau connected with other global crystals. We then submitted a third article 2012, Comet Lee and the birth of our new neighbour offering an explanation as to what has been going on in our skies of late. These are essential background reading material to appreciate what we are about to reveal. It is imperative we now finally release the most important of articles to the world. Read, think and decide for yourselves, this is your planet and your children's'. The most crucial choice of free will ever! In addition to these events, and often in tandem with high HAARP activity, and anomalous RADAR RINGS have been observed, mainly encircling military installations in North America. What is going on? We believe that in a number of instances these events were a process of 'targeting', which was completed around the 17th, November. Also witnessed were the numerous sightings of large black triangular UFO's, materialising in and out of our atmosphere, these are Plasma Target Specific Bombers. They are unmanned (drones) devices, which target an area, enter, dump and retreat through their locked vortex portals. To assist us in explaining what is actually happening we are going to initially refer the reader to the last article published 2012, Comet Lee and The Birth of Our New Neighbour, However, it is now crucial to understand what has, and is, going on around our sun, and how this will affect our planet and all that dwell on it. We now come to the most crucial hypothesis of this whole affair, and as you will see may in fact turn out to be much more than pure conjecture, this is HAPPENING right NOW, and we can no longer ignore the evidence which is materialising before our very eyes. Those anomalous objects, (termed Sun cruisers) and there are now at least two, are in fact PLASMA carriers, of gigantic proportions, said to be in excess of three thousand miles across! These carriers will initiate an artificial disturbance within the sun, causing the sun to eject two massive CME's . (Coronal mass elections) The trajectory of these CME's will be directed at earth, at which time all satellites will be placed out of commission, as will the entire power grids. It is at this point, we too will enter into the war with the Draconians. BELIEVE IT! These appear to be attempts, utilising electromagnetic field shielding from minor incoming, this will have no affect on the direct massive CME deployment whatsoever! The exact timing of the 'attack' is not known, but from information relayed to us it seems very soon, communication was terminated before an exact date could be established. All we have is the 'transmission' of Wednesday! Thursday, Wednesday/Thursday (repeated). Due to the increase in the electromagnetic field around the globe, it seems that communication is very difficult to penetrate. The plasma carrier will move closer to earth as the initial assault begins. The most upper thoughts in one's mind as you read are, understandably, why is this occurring and who is the aggressor? The answer, as to be expected is complex, and one that extends way back in time on this planet. To acquire a quick background on this, a read of the GENESIS CONNECTION may be helpful. We have to look to our true origins on this planet to find an answer, and as our time for a full explanation is very limited, we will merely point out the following. We, on earth, are a combination of races from several worlds, where the soul (see article on soul machine under Giza) migrates from one place to another within a given time frame. Our strongest representation on this planet is the Pleiadians, or Plejarians. The Pleiades is a star cluster situated in the constellation of Taurus, approximately 450 light years distant, in the time frame as we know it. However, the majority of the existing souls here are the one's which are displaced as they were held back from making ascension the last time around. Thus, it is the work of THOTH ancient Egyptian god of wisdom and many other attributes that is of the most utmost importance. Thoth has noted and logged each soul, while at the same time monitored its progress over time. Therefore, to make ascension one has to be preferably 'selected' as a group, not individually. A 'deal' was struck with the Galactic council way back in time, originally because the Plejarians had all but eradicated the reptilian life forms from the surface of this planet aeons ago. The Plejarians have since lived and existed under a completely different belief system, e.g. light verses dark. In our previous articles on the GENESIS CONNECTIONand 2012, COMET LEE we explained how we arrived at and the importance of, the date 21st December 2012 (also referred to as 'MAYAN END TIME) At this time the universe will begin to expand and all universal bodies will evolve to their next state. Whether the form is passive or negative depends upon their immediate relationships to their respective sources. Some will move to their second, third or fourth levels, while others will come under the influences of new (secondary) sources. Because the progression is linear, this time frame will have come full circle, however it is important to note that this time frame in fact will always exist. It exists because it justifies the existence of the next time frame. To illustrate this point we may take the example of the computer system used in the PHOENIX PROJECTS If the system utilised time (zero time) as being the time at the centre of the galaxy, that time frame will not exist past 21st December 2012. Those of you who have knowledge of Remote viewing techniques will appreciate the problems involved of 'viewing' beyond that date! Subsequently, they will not be able to vortex past that time. It is possible, but not recommended, to vortex through time frames connecting the two, a highly dangerous activity. See THE PHILADELPHIA EXPERIMENT. Therefore, to possess this knowledge, combined with the ability to implement said knowledge, would be earth's best defence system. To put this into perspective, would you send an attack force to a planetary system knowing that the force may be re-routed and vortexed in time? While simultaneously knowing that at zero time there exists no point of reference to calculate your exit with! Sheer suicide. Shades of STARGATE one may think? Earth was invaded aeons ago by a REPTILIAN RACE (Draco?) arriving in a gigantic carrier (possibly similar to our Plasma beam carrier). This race was ultimately driven off the surface of the earth by settlers of the Lyrian Empire and thus went underground. There, they remained in STASIS until at such time they would be 're-activated' by an incoming ship, such as the passing of Comet Lee and subsequent anomalous objects observed orbiting our sun. It is understood that at some point in the near future earth may be invited to join this 'federation of Planets', but apparently only if successful in repelling this forthcoming 'invasion~ force. Alternatively, planet earth could become the target of the Federation until the Reptilian race is removed. Aeons ago deals were made, which still remain valid today, between our forefathers and the 'Council', or Federation, which prohibit unsolicited intervention by outside members allies. Unsolicited, yes, but who here has the authority to ask on our behalf?? There is a possibility of a natural defence, via the GLOBAL GRID OF CRYSTALS situated on ancient sites around our planet, of which we will describe in more detail below. There is also a possibility that, if for some reason the work by some of our 'scientists' has put us into a time lock, we may ask for 'outside' assistance, however this scenario is governed by our explanation regarding unsolicited assistance above. STONEHENGE,MEXICO,EASTER ISLAND,NEW ZEALAND (Green Stone Trail), NEWGRANGE (Ireland)TIBET, IRAQ (Kurdistan)Ayres Rock in AUSTRALIA and many more. Remember the earthquakes at these and other sites?? As we explained in our article CRYSTAL CLEAR the centrally located crystal, lies deep beneath the Pyramid complex on the Giza Plateau, Cairo, and adjacent to what some refer to as THE HALL OF RECORDS This is the crucial crystal, which needs to be re-aligned to stabilise the earth's core. Once this has been carried out, all other crystal should re-align. This is purely a succinct overview in the time available to inform YOU, the people of this planet what is going on, you have the choice of FREE WILL, exercise it. - PLEASE. These missing files are still in the process of being loaded, so you may find next time you visit, the layout will have been improved. 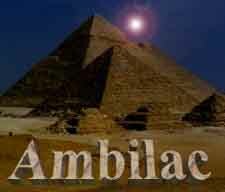 The continuation in the Ambilac missing files series.